So all the 'religion based' decisions comes down to money. Interesting. No, all the business decisions come down to money. That does not sound like a reasonable response. See chava for example of what happens when you make whats mutar assur. Oh yes??? How much does the חובות הלבבות elaborate on ...היו פורשים משבעים שערים של היתר שלא ליכשל בשער אחד של איסור? What does the mishna in Avos mean with all the גדרים וסייגים? Re: Why do some Jewish communities prohibit women from driving? While I have no interest in having in arguing about this, if you take the the majority of Chassidishe Women from BP, Willi, Monsey, KJ ( Lakewood I'm assuming is different but I may be wrong ) the majority of Chassidishe women don't have smartphones. For some of those old ladies it's an easy ticket to a free retirement community. JJ1000's 10,000 Post Featuring: A day in the life of Dan, Giveaway, & More It's hard to imagine I joined DDF over 10 years ago, of course this was after I made the first comment on DDMS 14 years ago and joining ctown forums after that. I really can't begin to count the memories I have here on DDF, one that comes ot mind is the first major DO where @Dan @AsherO @BrooklynCPA @Mikeoracle @Smirk @MOSES @whYME @yare @Avid Reader @Chachem Balaileh @mancunian @yid @SuperFlyer all had an amazing time. Since that DO I have made countless friends and received countless favors from DDF members, who truly are like family. Some that come to mind. @rots5 and @moish putting me up in Israel while @moishebatchy offered my friends and I extra sheets for our stay, this was of course when we went with the first El AL glitch tickets. @SamKey For hooking up his apartment for Pesach and @Emkay for some awesome kugel, that I am pretty sure had an ok hechsher. @Chaikel for setting up a sweet Jamaican honeymoon. @steve2 and the fights other new comers used to love to pick like @AJK when he was a total troll back in the day and @HelpMe who IMO had no idea what he fell into when he got here, and I'd like to think was very happy that he stayed. Of course there was @JEWDA who it's still hard to believe isn't here anymore, going to his widows house the day after my Lchaim/vort with my then fiance will always be very special to me. The way DDF comes together when someone is in need (@SBS thread) is so heart touching it's hard to explain. @mileagejunkie @Marco Polo @myi @YossieW @stooges44 @davidmal @Yaalili @B.D.Da'ehu @ben89 and of course @Davidthebest are my 100 HT club peeps, and have helped ignite the great deals we post every day to help tens of thousands of people save (and maybe spend) money every day. I really appreciate every deal that's sent to us and that's posted on DDF. I couldn't possibly remember all of the countless nights I stayed up to argue with someone that was wrong about the most random things imaginable. @churnbabychurn @ExGingi @aygart @ChaimMoskowitz and of course many others can always be counted on for some good popcorn when it's needed. And @sky121 can always be counted on for a balanced and positive view on any subject. Some dude coming along looking to sell a stinky old fish tank has drastically improved the trip reports and photography skills of DDF, hats off to you @Something Fishy. @DH Data Recovery practically owned the tech deals on ddf at one point, and he @chevron and @txtmax4 are always good for a wine recommendation. One day I may even meet @henche though that is likely IMPOSSIBLE. Big shoutout to @BAHayman, @Eli, and @Suave for making DDMS/DDF able to run and be what it is today thanks to them! The first DDF shidduch was super cool @Lou Bob @MC to many more, spending shabbos together in Aruba on the Hyatt Price Mistake was awesome. Crazy to imagine there are over 300 members with 1,000+ posts so my apologies, I'm sure I missed many memories. I made a thread asking what I should do for my 10,000 post, and I will try to do most of them below. Dan wakes up from an amazing night's rest on his W Hotel mattress. and tell his Echo Dot which he got for free to turn on the Breville Coffee Maker plugged into his smart plug. Get into hisNissan Altima and take the quick 2 minute drive to shachris. After davening, @AJK texts Dan that AA has a Price Mistake to LA in F for $5, if they buys it in the airport and flies today. Naturally Dan just heads straight to the airport and boards the flight to LA. On the plane there is a dog next to him, which was strange at first until he realized it was just @meshugener flying in F as well. In LAX Dan visits the United lounge, which he has free access to with his lifetime membership and his JMPRCC. He picks up his rental from Silver Car and heads to Tierra Sur for the Lunch DO. 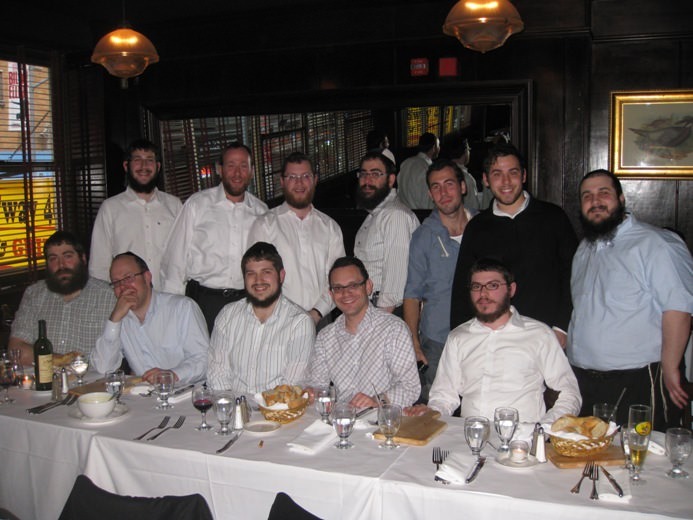 In LA @Yehoshua @Cholentfresser @Yaalili @PlatinumGuy @yehuda @D93 @etech0 @ilherman and @David Smith all meet up for the DO. All of a sudden Barto walks in and instinctively, the group makes a beeline for the door. But before they can bail, he stops them...And says he planned the AA Price Mistake in order to get a face to face with Dan after all these years. Barto has realized after years of being the bad guy, he just wanted to hang out with the cool kids on DDF from the olden days like @Drago @Saver2000 @Cbs @Q274 @MarkS @aussiebochur , @chuchem and @myb821, he said even though it's @noturbizniss but he left his old job and as he was leaving he reinstated all the damage he's done over the years, returning millions of miles to their rightful owners. After Lunch Dan drives back to the airport and rushes to catch his flight home as he realizes it is almost time for his UPS delivery. On the plane he uses the on board Wi-Fi to make some posts and read DDF (this is actually what takes up 18 hours of the day every day, besides shabbos). He makes it home just in time to receive his UPS delivery of US Mint coins. He had set up delayed delivery back in 2009 and every day since then he has been receiving a $10k shipment of US Mint coins shipped via the UPS Method. To date this has netted a cool 30,000,000+ SPG points. At the end of the day he reflect on life and remembers what is really important and what he is thankful for. Now it's time to count to 10,000 and fall asleep. Just some simple tricks for car rental status. You can get free Sixt Platinum status when you sign up with this link. Once you confirm your email address you can login and instantly get your card online that shows you as Platinum. And apply for Enterprise Platinum here. Avis you can try via social media or calling sometimes. Fell free to add more matches in the comments. A quick chazara of all my posts: Your attitude is what decides your mood, not what's going on. You can have a trip ruined if something goes wrong, or it can become one of the most memorable trips of your life. Roll with the punches. Always have a healthy dose of cynicism. Understand that someone with beliefs to the right of you or the left of you aren't wrong, just different, a rainbow would be pretty ugly with just one color. Enjoy life and always cherish what's most important to you, and try to keep that in mind every second of every day. As a last note I'd like to do a small giveaway. just comment on this thread and I'll choose one winner to get a Google Home Mini and another winner to get the best card games IMO being Codenames and Monopoly Deal. I can't thank DDF enough for giving me all the opportunities life has to offer, from making friends, traveling the world, to supporting my family, I couldn't do any of it without this truly amazing community. Just to end off with a special thanks to Dan for starting it all and giving me the opportunity to grow the site and live the blessed life that I do. Re: Looking to buy a Business You can buy mine, it's been established for around 2 years now. Incorporated in OH. It doesn't make any money but you're welcome to buy it.